The third set of stories I wrote, all here on the one page. Featuring the three short stories, the anthology, and the paperback edition of all four. Elliot Gunfield has been in a coma for a month since that fateful night on Halloween. The night The Howler came into their lives and destroyed all he knew…including him. After waking, he finds that he’s different. He feels 1083 years old, that he’s lived a thousand lifetimes, and he’s running out of time. He doesn’t know why, just that he is. His dreams are haunted by bony creatures and hands pulling his heart out of his chest, and he finds out what happened to his best friend, Sam Almaw. With only two weeks of school left for the year, Elliot returns to find he is now the freak of the school. It seems that dying has left him with an unnatural eye colour, so different to his usual dark brown. The fiery amber of his glowing eyes freaks everyone out, especially Gretchen Merryweather, his arch nemesis. But why can’t he stop staring at Gretchen, and why does his shadow look messy and black? Gretchen Merryweather had felt the brunt of fellow schoolmate Elliot Gunfield’s wrath and paid for it with her life. After that fateful night of Halloween when The Howler came into their lives, and with the end of the school year fast approaching, Gretchen suffers serious repercussions thanks to Elliot’s actions. 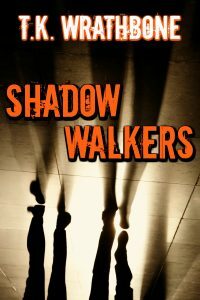 He was trying to get rid of his Shadow Walker and in the process, took Gretchen for his prey. But she paid his fare to the other side and came back with her own creature in tow. 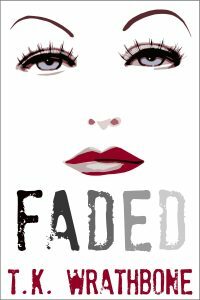 What has come back with Gretchen to terrorise her dreams and her life? It’s something that sends her to the hospital on her death bed and seems to be sucking the very life and soul from her body and making her fade away. By turning to the one person she knows can help, Elliot, can Gretchen find out what it is that’s taking her life before it’s too late? 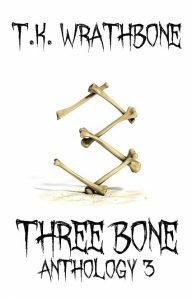 THREE BONE: Anthology 3 is the paperback version of the above four e-books. It is the only time you will get them in paperback…at this stage.